The University Of Lakki Marwat Khyber Pakhtunkhwa 2018. Qualifications: As per HEC criteria for appointment of Professor. Maximum age: 50 Years. 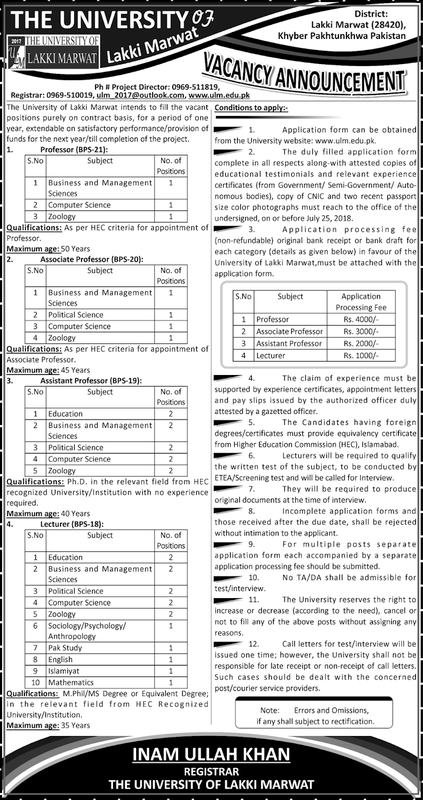 Qualifications: As per HEC criteria for appointment of Associate Professor. Maximum age: 45 Years. Qualifications: PhD in the relevant field from HEC recognized University/Institution with no experience required. Maximum age: 40 Years. Qualifications: M.Phil/MS Degree or Equivalent Degree; in the relevant field from HEC Recognized University/Institution. Maximum age: 35 Years. 1. Application form can be obtained from the University website: www.ulm.edu.pk. 2. The duly filled application form complete in all respects along with attested copies of educational testimonials and relevant experience certificates (from Government/ Semi-Government/ Autonomous bodies), a copy of CNIC and two recent passport size colour photographs must reach to the office of the undersigned, on or before July 25, 2018. 3. Application processing fee (non-refundable) original bank receipt or bank draft for each category (details as given below) in favour of the University of Lakki Marwat, must be attached with the application form. 4. The claim of experience must be supported by experience certificates, appointment letters and pay slips issued by the authorized officer duly attested by a gazetted officer. 5. The Candidates having foreign degrees/certificates must provide equivalency certificate from Higher Education Commission (HEC), Islamabad. 6. Lecturers will be required to qualify the written test of the subject, to be conducted by ETEA/Screening test and will be called for Interview. 7. They will be required to produce original documents at the time of interview. 8. Incomplete application forms and those received after the due date shall be rejected without intimation to the applicant. 9. For multiple posts, separate application form each accompanied by a separate application processing fee should be submitted. 11. The University reserves the right to increase or decrease (according to the need), cancel or not to fill any of the above posts without assigning any reasons. 12. Call letters for test/interview will be issued one time; however, the University shall not be responsible for late receipt or non-receipt of call letters. Such cases should be dealt with the concerned post/courier service providers. Note: Errors and Omissions, if any shall subject to rectification. REGISTRAR THE UNIVERSITY OF LAKKI MARWAT.